With sweet, natural and earthy tones, Vac Pack Beetroot is a store cupboard staple and a very versatile ingredient - in risottos, soups and dips, as a pizza topping, or oven-roasted with carrots and parsnips. It's also a fantastic alternative to sugar to make delicious chocolate brownies. 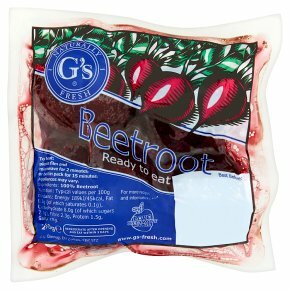 Vac Pack Beetroot can be heated in the bag – either add to boiling water and simmer for 15 minutes, or pierce the top of the bag a couple of times and microwave (3½ mins at 650w or 3 mins at 750w). Leave to cool for 1 minute before opening carefully. Ready to eat. Naturally fresh. To heat:Pierce film and microwave for 2 minutes, or boil in pack for 15 minutes.Applicances may vary.